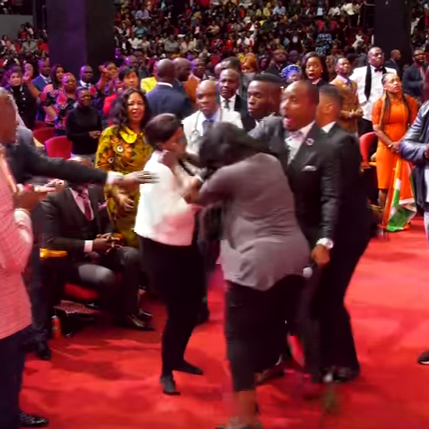 Pastor Alph Lukau of Alleluia Ministries International began to prophesy two friends who came to his church for prayers and the prophesy led to a fight when it was revealed that one was responsible for the other's business woes. One of the women is named Pamela and the other is Japa. During the prophecy, Pastor Lukau told Japa that her business partner who usually invests so much in her business has suddenly turned his back on her. Japa agreed that this is true and the pastor went on to say that the business partner has also demanded that she returns the plane tickets he bought for her and has also taken back the money he gave to her. Japa also agreed that the pastor was right. The pastor then went on to tell her that the cause of her problems is someone very close to her. "Pamela Why?" the pastor kept repeating. Watch the video below starting from the 4:28 mark.